Reporting from Nairobi, Kenya - In a year as a "freelance" slum electrician, Francis Otieno has been shocked five times. Three of the accidents were "not so bad," just enough to throw him across the room. Two nearly killed him. "I just cried out. I didn't know what was going on. I passed out," he says. "For two days, I didn't know where I was." But he was luckier than his best friend, who had the job before him: He was killed when he jumped on a roof to fix a short, unaware that the roof was live because a rat had nibbled at a wire. If people here in the Kibera slum outside Nairobi, the capital, waited for the government to connect every mud hut and corrugated iron shack to electricity, they'd never have light. It's DIY or do without. Here's how it works: Otieno's boss gets electricity legally from Kenya's power authority, then sells it to Otieno and two others. From there, it gets a little less legal. He supplies Otieno with wire to connect any of the 40 households in his patch. Otieno collects a monthly payment of about $5 per house, skimming off a small commission and delivering the rest to his boss. 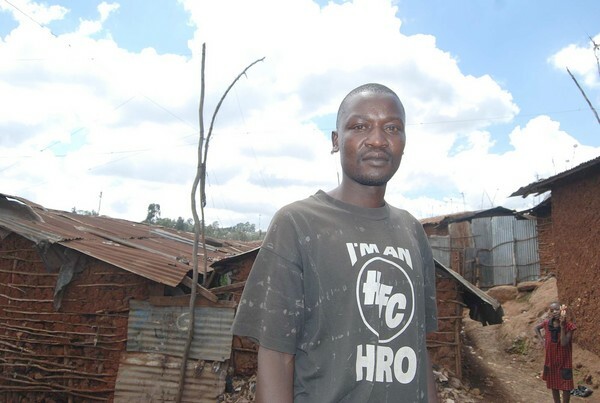 Otieno, 36, is a hero to his neighbors. Electrical problems are frequent. He gets calls from dawn until after dark. If he's sitting down to dinner, he abandons his plate and goes to investigate. "I leave my dish of food and go to serve them first," he says. But the dangers are many. "Sometimes children or mothers died when they have a short," says Otieno, a father of three. "Sometimes people's houses burn down." He speaks slowly, searching for words, pausing frequently. The main problem for a freelance electrician is rats. There are millions of the rodents in Kibera, creeping into people's shacks, chewing through electrical wires. The other danger is the rainy season, which turns Kibera into a slippery, muddy swamp -- particularly "downtown," as the bottom of the hill where Otieno lives is known. The water trickles through shack roofs as leaky as colanders, dripping into electrical wiring and sometimes shocking the person trying to fix the damage. Out in the rain, struggling to fix wiring with wet shoes and sopping clothes, Otieno has had a couple of shocks that way. Sometimes the problems are caused by people hanging clothing on the electrical wires to dry. Sometimes the money Otieno collects doesn't cover the power used in his area. There are people who can't pay. "Not all the neighbors pay their money on time. Some can go three or four months without having money to give us," Otieno says. He gives them three months' grace before cutting them off. Another reason the books don't balance is the thieves who hack into the wires, connect up their houses and draw off power without paying. "They just come at night," Otieno says. "They might not be using their lights, just the radio, so no one knows. "I tell them, 'You're a human being just like me. Just come to me, because you've got problems. Even me, I've got problems. We can just talk and work it out.' "
Otieno's dream is to save enough capital to start his own welding workshop, so as not to rely on bosses for pay. But it's an elusive one. So, for $12 a month, he risks his life as an electrician. "It's a risk, I know, it's a risk. That risk isn't good," he says. "But life is hard." If things keep up the way they are here, that story might be about one of us next year. Obviously an exaggeration, but it would not surprise me to see more people resorting to having to form their own means of making a living like this guy did. If ignorance were bliss, that reporter / author would be the happiest guy in town. Full of misplaced sympathy and faulty logic (probably born of ignorance), the article completely glosses over a few basic facts. First, Kenya is hardly unique. Not so long ago there was a similar thing floating around about India. When the Berlin Wall came down, we had these stories out of eastern Europe. I'll bet China and Latin America have similar stories. I could examine the technical aspects, but I would be off target. Rather, the root of this problem is the same that inspires Cable TV theft: this frenzy to get something you don't need without paying for it. If these folks were happily living without electricity a few years ago, they can live without it today. The mentality of desperation is illogical; just how critical is that I-pod? "Free," or "cheap" has its' price. Someone, somewhere has to pay for proper distribution equipment, training of the tradesmen, tools and PPE. Instead, these folks have institutionalized hackwork and hired Murphy as the foreman. Mud huts and tin roofs? Sort of makes me shudder when I think of the plumbing. Even the simplest cheapest meter there would cost as much as a lifetime of electrical consumption. $5/month isn't even 100W of average use. Wanna bet he's wiring these houses up with #18 and no grounds? There's got to be better solutions than this. Extension cords, for instance. So, let's get one thing straight here, who is kidding who? This guy is selling electricity over an un-safe "network", in most Western countries that would not fly, the person that on-sells electricity would be required to have a certain level of safety inherent in the "network". By that I mean, fusing and other such protection devices. At the end of the day, Kenya's power authority is causing this problem, by selling their energy to such a low-balling retailer that has NO intention of actually building a safe network, but will take the money from those that use his "network". All in all, what is happening here is that all of the money the retailer is getting off of his consumers is going into his back pocket. Before journo's start to whine about the in-justice here, why did they not talk to the people causing it in the first place?